UC Browser Mini for Android update with new cooler UI and increase stability. This is one of the best browsers on Android. UC Browser Mini gives you a great browsing experience in a tiny package. It’s a lightweight browser especially useful to users of Android phones with lower specs and less storage space, but still packed with great features. More easier to use and it's faster than any other browsers. By using this you can easily access the web with turbo speed. Low on space, high on performance, also has an built-in video player, good performance in 3g network. UC Browser Mini app lets you do anything! It really helps you to get on Facebook, Youtube and Google. It's the fastest browser even in 2G network and downloads apps and games at good speed. Recommend this app for best browsing experience. Full Screen Video - Supports full screen online video playing. Night Mode - Protect your eyes in the dark. Smart Downloading - Supports multi-task, background, and cloud downloading with auto reconnection. 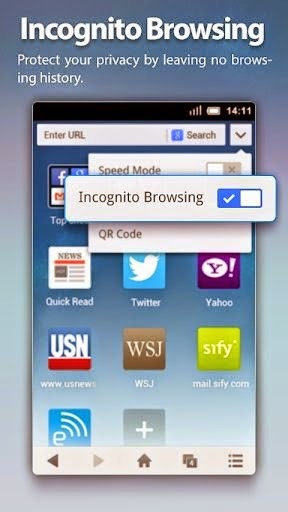 Incognito Browsing - Private browsing to protect your privacy. Optimized Layout - Web pages are specially optimized for mobile screens. Fast Browsing - Speed Mode fetches the most suitable version of the web page based on your network.